Chip on Board (CoB) LEDsHot! 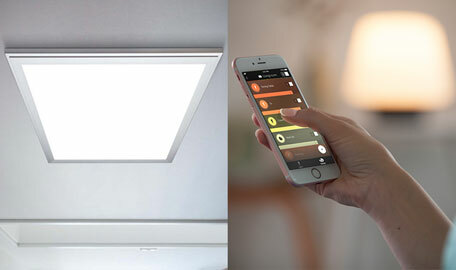 Smart Lamps & Wireless LightingHot! We are a specialist of high performance LED light solutions. As part of the early success of LEDs we have extensive application knowledge from a wide range of sectors. 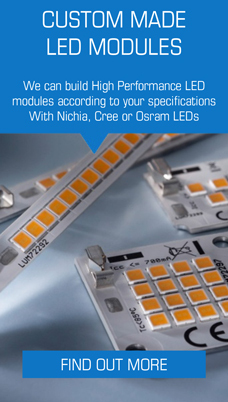 Since 2010, we have developed and produced NICHIA LED modules in a state-of-the-art production facility in Germany. These modules have been used successfully in a wide range of application and developed specifically to meet customer specifications. Our range of Lumego LED panels combine the performance of Nichia LEDs, with the well known quality of German Design and reliable manufacturing in Europe. The flexible LED strip LumiFlex700 Professional SunLike 700 is developed only for the highest demands. The flex strip is equipped with an incredible 700 SunLike LEDs with CRI98 over a length of 5 metres. These special light emitting diodes, developed by the technology companies Seoul Semiconductor and Toshiba Materials, have a very high CRI value of almost 100 and are capable of reproducing the entire spectrum of sunlight. This complete colour spectrum ensures that colours are reproduced in a particularly realistic manner and that even the smallest colour nuances can be reliably assessed. The LumiFlex700 Professional SunLike LED strip can be cut every 50 mm with scissors and has a self-adhesive back. This makes it incredibly versatile in terms of its usability and makes for an especially easy installation. Whether used as coving and base lighting, for trade fair and kitchen construction or in luminaires - the LumiFlex LED strip convinces with simple installation, low overall height and maximum efficiency. Cove lighting with LED strips: design basics needed to achive optimum results.